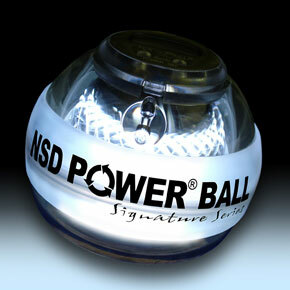 The "signature" is a special edition of the Neon Pro Powerball. If you are new to powerballs or you haven't read the Neon Pro mini review then we will tell you that powerballs are gyroscopes that can be used to excercise your upper body, specially your arms and they are a great fun to use too. You spin the ball using very short circular wrist movements and as you spin the rotor will start spinning inside creating an opposing force, this resistance will make your muscles work harder and harder as you spin the ball faster and faster. The end result is a constant search for new speed records and a lot of fun while at the same time excercising your forearms, biceps and triceps. This special edition comes in a translucent gray case with a gray rubber band around and shines white LEDs when activated. As well as the Neon Pro the signature edition comes with the counter at the top that can keep track of your rpm records and endurance results. The performance is similar to the Neon Pro with just a different look and feel, the special edition comes with a wrist lanyard, a DVD with movies and training videos and a couple of extra starter strings. You can read more at the official website and order one for $50 from Powerballs.com e-store. 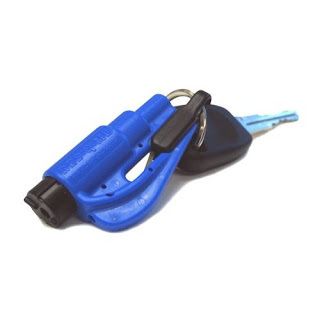 The ResqMe tools is a dual purpose safety tool mainly intended for drivers but can also be used in other vehicles and for people working in emergencies like doctors, paramedics, policemen and firemen. The first function in the tool is a spring-loaded head that can break side and rear automotive windows, you press the head against the window and after applying some pressure a spring activates a pin that punches the window breaking it. It won't break laminated windshields but normally works with side or rear windows. The activation is easy and will work underwater if needed. The second tool is a seatbelt cutter blade, the blade is protected by a plastic cover that can be removed pulling the splitring that comes with the tool. You may need both hands to remove the plastic cover of the blade so it may be safer to keep the blade uncovered if the tool is not in your keychain. The ResqMe is an affordable emergency tool, keeping one in your car is probably a good idea if you don't have something similar. You can get it for $8.95 from EDCdepot.